How did you first get involved in screenwriting, and when did you know that it was something you wanted to pursue? IP: I took two screenwriting classes at Dartmouth, so I had written one screenplay, and there were some screenwriting contests that I had won when I was at Dartmouth, so I thought maybe I was good at it. But that was more of a delusion at that point. I graduated and moved to New York because I needed to get a job, and I worked as a paralegal, and I hated it. I remember one day I accidentally dropped my Blackberry 17 floors down an elevator shaft, thinking “Did I do that on purpose?” And I thought subconsciously I probably did. I just didn’t want to be a lawyer or anything like that. I still didn’t know what to do, and I moved back home to Las Vegas and was a cocktail waitress. I was really depressed, and I just thought maybe I should apply to grad schools, and then thought maybe I should apply to USC film school for screenwriting. It was sort of a whim, and I remember it was Dec. 10, and I looked on the website and the application was due that day. And I wrote all these essays that you had to write and submitted them an hour before the deadline. Then I saw that you had to have taken the GRE and sent in your transcript, so I thought I would just apply next year. Then I got lucky because the department was moving offices, and they thought they just lost half of my application. They really liked my writing samples, so I ended up getting into USC screenwriting program anyways by crazy luck. So I moved out to Los Angeles and did my MFA in screenwriting, then took an extra year of production classes. After that, you don’t really get to start writing right away unless you’re really lucky, so I knew I had to work, which turned out to be a good thing. I got some writers’ assistant jobs on a pilot that didn’t go anywhere, and I got a director’s assistant job on a show called “Wilfred,” which has Elijah Wood and a talking dog. I would get up at four in the morning and write, then go to work at six until seven or eight at night. Every day I would write for an hour or two each morning. I just thought that if I really wanted to be a writer, I’ll get up and do that. While I was working that job, I was applying for writing fellowships because the show was in the last season. I sent NBC a feature piece that I wrote for their fellowship for feature writing. They told me I would have to submit another feature if I made it to the second round. I thought I didn’t have a chance, but I ended up getting into the next round, and they told me I would need a second one in three weeks, which I didn’t have. I was house-sitting for the director of “Wilfred,” and it was Christmas, and my family came to visit me while I was frantically working on my screenplay, but I got it in and won the fellowship. So I got an office at Universal, and I got paid, and I got to write a movie for them. They auctioned some of my scripts, and it was really great because I got an agent. It was really how I got a start in the business. How do you feel that your time at Dartmouth has shaped your experiences in the world, whether it be the entertainment business or everyday life? 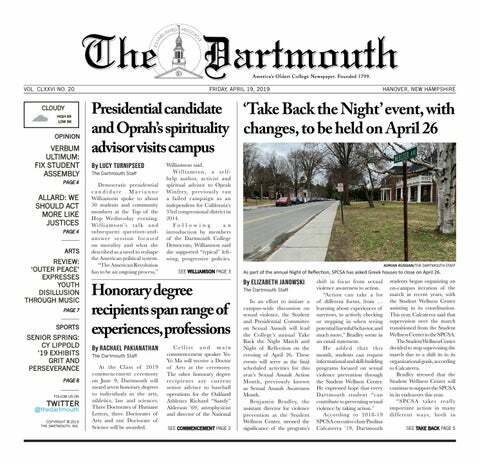 IP: One thing about Dartmouth that I think is special is that I feel like, compared to other schools, Dartmouth is more about being social and having a community. I think that’s good ground coming into the film industry, where everything you do is about who your friends are and what relationships you build. And that you’re not only good at what you do, but you’re good to work with. Having relationships in life outside of work is something I feel like I learned to value and cultivate and balance, too. I think I have a happier life now because I know that people are important. What advice do you have for those trying to break into the entertainment business as writers? IP: It depends on who the person is because no two people’s paths are going to be the same. That’s something to know if you want to do it — you have to make your own way, and your path is going to be unique to you. It’s also good if you’re willing to work and not just as a writer. You should be willing to be an assistant and make time for writing. Don’t think anything is beneath you because it’s not. Everyone can be a writer eventually. They just have to work for it. Be humble, and be willing to work really hard.